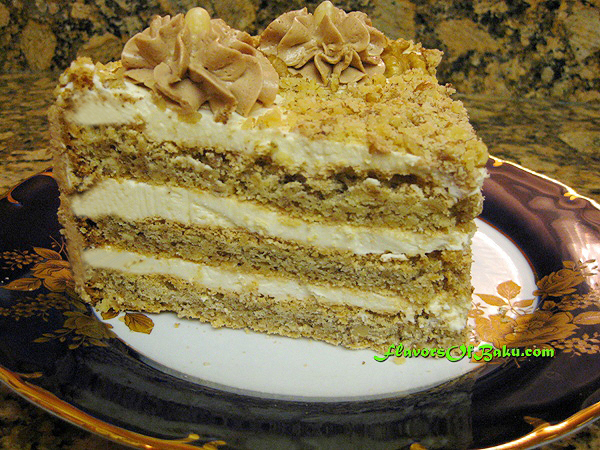 CAKE APSHERON – a favorite of people from Baku. Its original walnut flavor with silky cream made from butter and custard was remembered by people all throughout Baku city in Soviet Azerbaijan. Cake Apsheron was delicacy in those days and even now it’s difficult to find stores that sell it. For baking the layers, use nonstick 10-inch springform pan with removable sides. Each layer has to be baked separately. 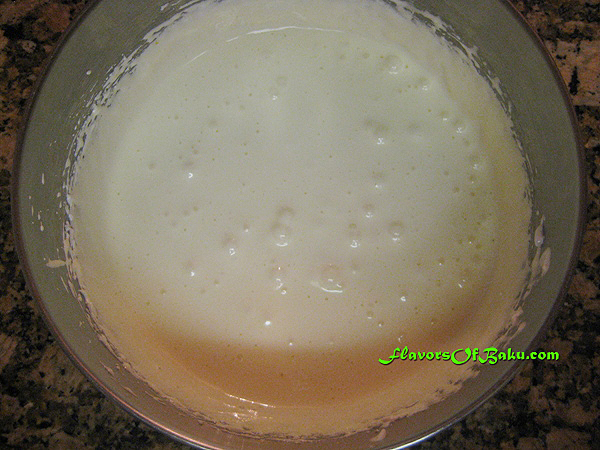 The batter can either be prepared for all the layers at the same time and divided into 3 equal portions (about 2½ cups per layer), or individually for each layer as suggested in the recipe below. 1. Separate the whites from the yolks of 2 eggs. Move the whites to the bowl, making sure the bowl is completely clean and dry. If you get a smallest drop of yolk or water into your whites, will prevent the whites form needed volume. 2. 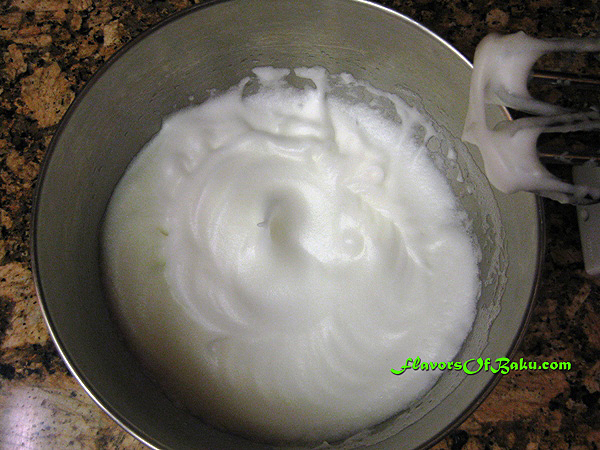 Beat the egg whites using an electrical mixer starting with low speed, then increase the speed to high and continue beating them until they double in volume. 3. 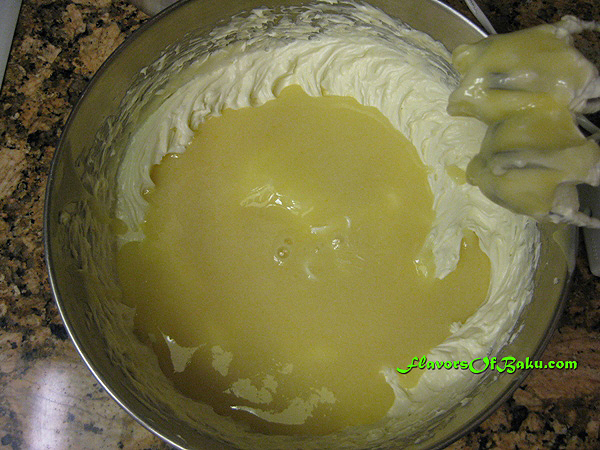 While continuing to beat the egg whites, add 3/4 cup of sugar in small portions, and beat them until stiff peaks form. 4. 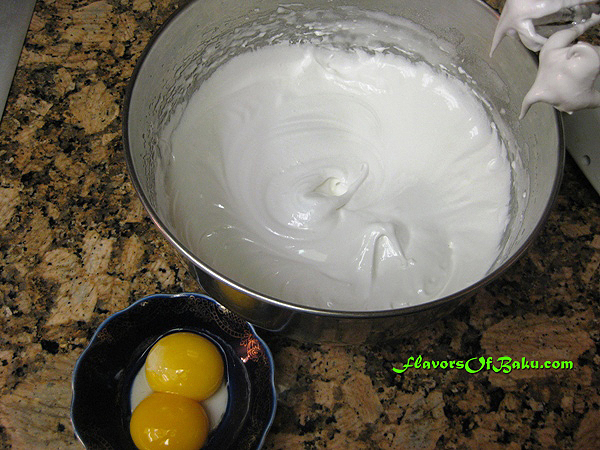 Add 2 egg yolks, one by one, while continuing to beat the whites. 5. In a mixing bowl, combine all the dry ingredients—sifted flour, baking powder, and vanilla sugar, then add crushed or chopped in a blender almonds and walnuts and stir. 6. 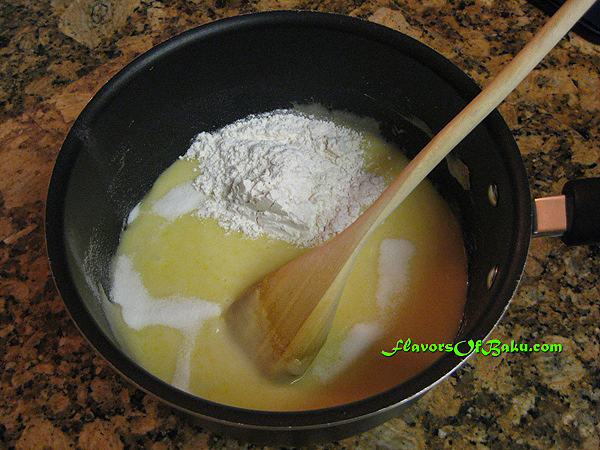 In the beaten egg mixture, add 1 cup of nut-flour mixture (alternatively, you can add ½ cup of nuts and ½ cup of flour separately) and stir gently with a spoon in one direction from the bottom up, until it is very smooth (do not use electric mixer). 7. Preheat the oven to 180F (350C). 8. 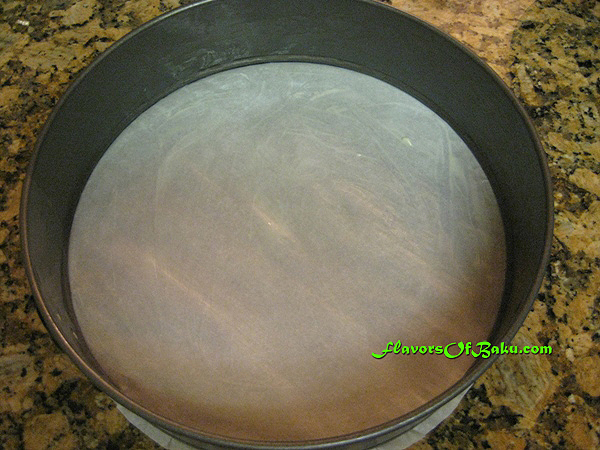 Cover the bottom of the baking pan with a parchment paper and grease the inside of the pan with butter. 9. Pour the batter (dough) into the pan, spread it with a spoon or spatula, and bake it in the preheated oven for about 20 minutes or until the top of the layer is crispy and golden-pink in color. While it’s baking, the oven should not be opened, otherwise the layer will fall. 10. Remove the pan from the oven, let the layer to cool down for about 10 minutes, then remove it from the pan and leave at room temperature to cool completely. 1. 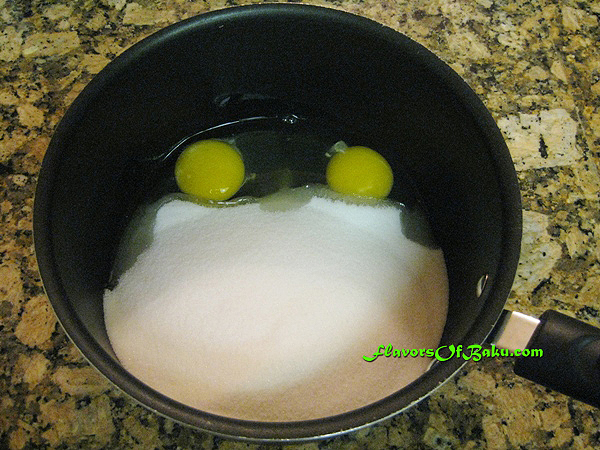 In a saucepan, whisk the eggs and sugar. 2. 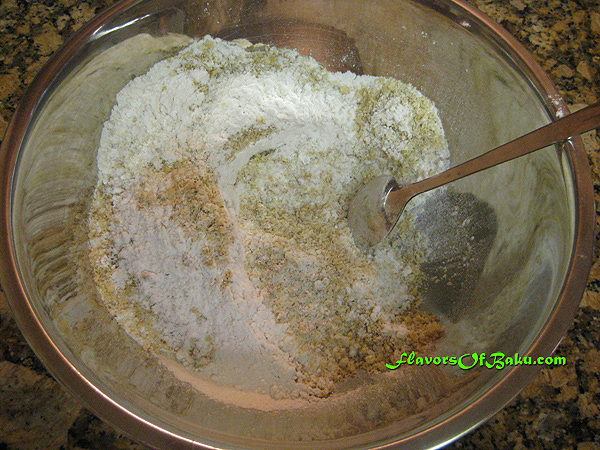 Add flour and vanilla sugar and mix everything together. 3. Pour cold milk in the mixture and stir. 4. 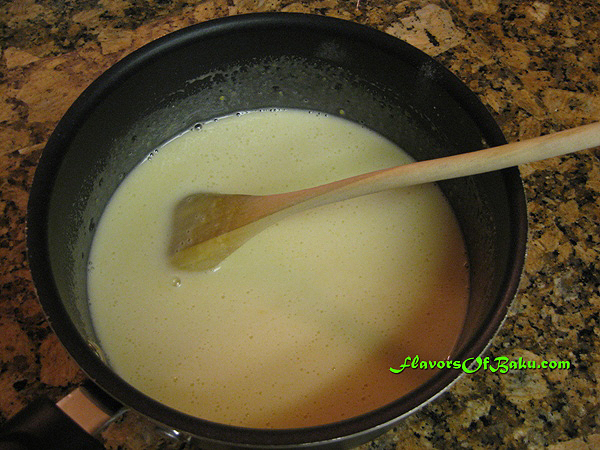 Cook the mixture over medium heat while constantly stirring. 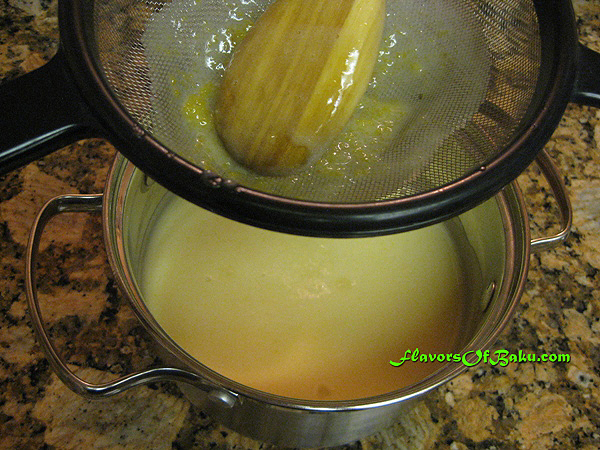 Once the mixture is boils and thickens, remove the pan from the heat and leave it to cool at room temperature. If the custard cream forms lumps, pour it through a sieve. 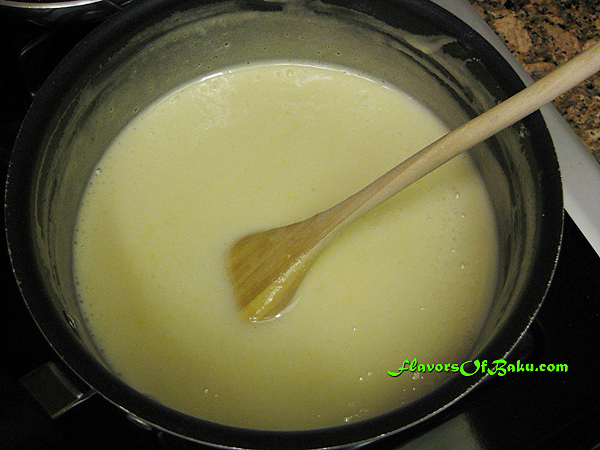 You can prepare the custard in advance and chill it in the refrigerator. 5. 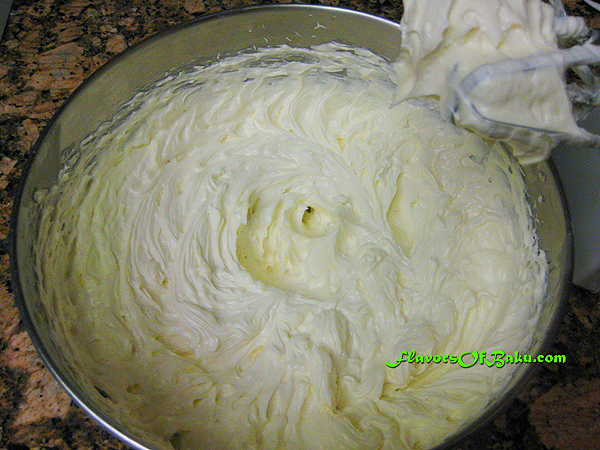 Using an electric mixer, beat butter softened at room temperature until it becomes a fluffy cream. Alternatively, you can use sweetened condensed milk instead of custard cream, and beat it together with the butter into a smooth cream. 7. Save some cream for decoration. 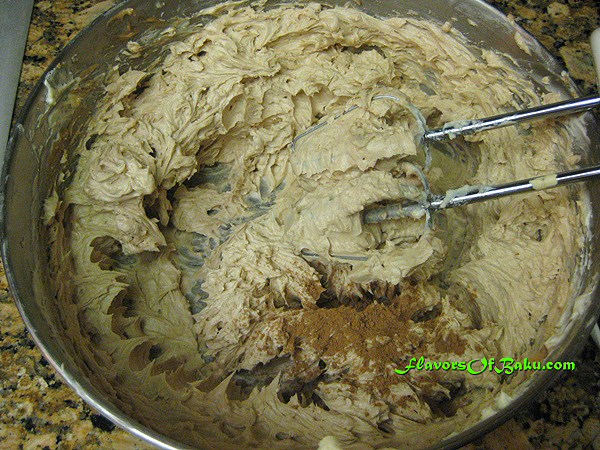 If you have cocoa powder, just add 1 tbsp to the cream and beat it. 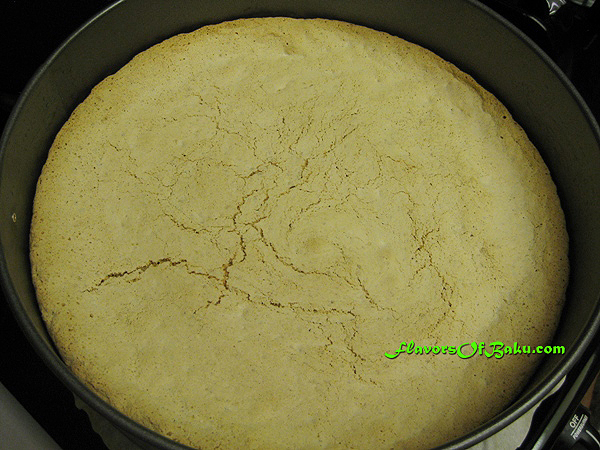 Place the cooled cake layer on a serving plate or baking paper. 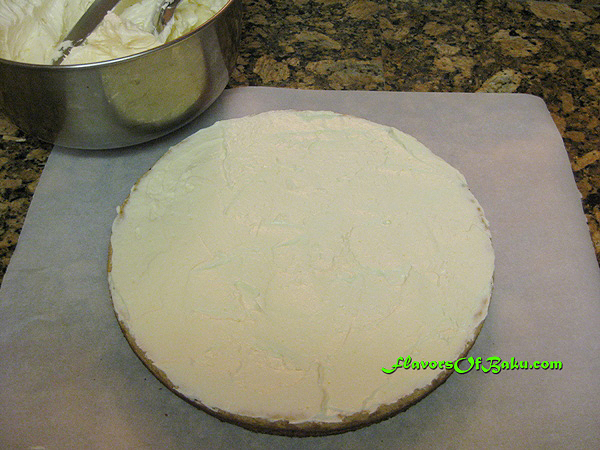 Place 4-5 tablespoons of cream on the layer and evenly spread it across the surface. 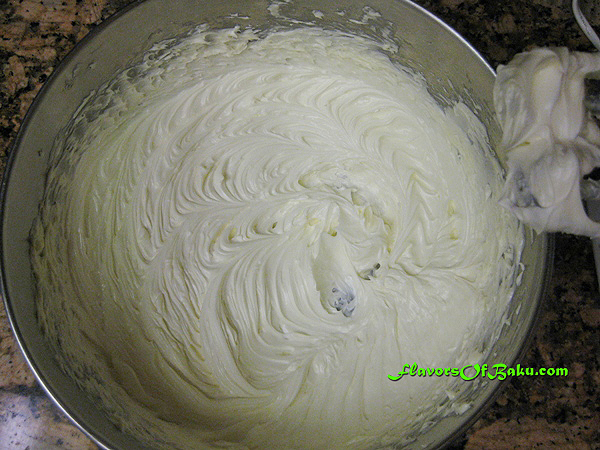 Then, place the other cake layer on top of the cream, and repeat the process with all three layers. Be sure to calculate the cream so that there will be enough for all the layers, the edges around the cake, and decoration. 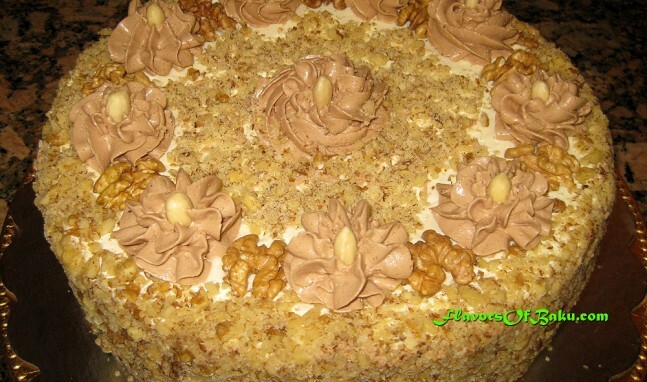 Decorate the assembled cake with the chopped walnuts and cream. 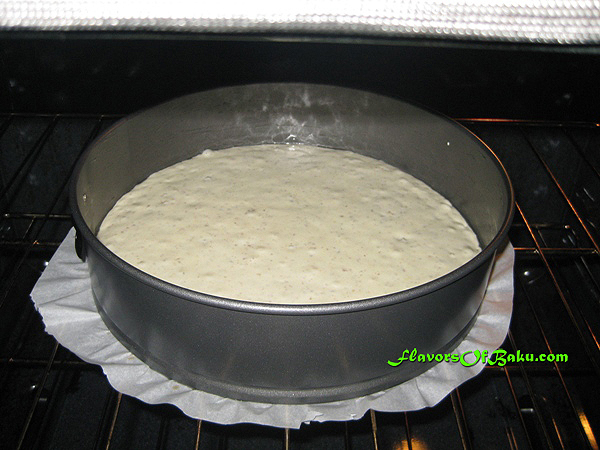 Leave the cake at room temperature for 8 hours or overnight, and then refrigerate it. 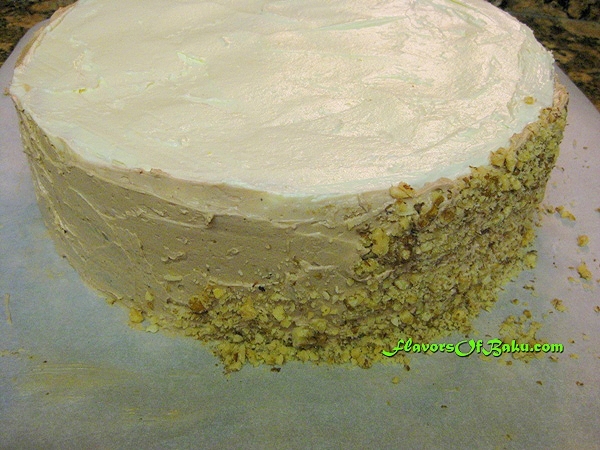 The layers will absorb the cream and soften the cake. Store “Apsheron” cake in your refrigerator for the long term, but pull it out and left it sit an room temperature for an hour before serving so it softens.